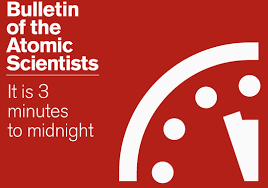 Doomsday Clock: three minutes to midnight. · I will miss Holly Sykes. I had grown fond of her though not in love with her as the main characters of the substories, Hugo Lamb, Crispin Hershey, Ed Brubeck, and Marinus, all are. While Holly may have been spurned as teenager, love and loyalty dominate the rest of her several key relationships. That love and loyalty (almost) counterbalance the world’s bleak state by book’s end. Holly is the only fully realized character in this 600-plus pager. · The Bone Clocks is not about characters; it’s more about how power plays out in different times, different places, different genres. · Each section or substory begins as if it’s independent, then links with increasing degrees of connectedness to the previous stories. The effect for this reader is one of repeatedly beginning anew. In each it took time for me to find my way, to engage. The result was a choppy reading experience, but one where I also delighted in the surprises of the revealed linkages. There's always a substory speaking beneath the present story; often someone subspeaking beneath what's being heard. Horologist’s Labyrinth 2025: In this fantasy section we come to full knowledge of the motives and paranormal activities and tools of the warring Anchorites and the Horologists, a war hinted at earlier. Bone Clocks is another word for those of us who live in time, as opposed to immortals or temporals. The section is narrated by Marinus, who like others goes by several other names. Names and histories of characters defy instant recognition in much the way those of Russian novels do; this section is best read by keeping character lists/ notes for sorting. The battles however, are appropriately, movie- worthy spectacular. Sheep’s Head 204: “Worrying times, Holly Sykes.” The final episode, one of dystopian fiction, leaves me feeling bleak and uneasy. I calculate. 2043 is just 28 years away and unless I live as long as parents (now 97 and 92), I won’t see it, but my precious loved ones likely will. Given Mitchell’s imaginative version of it, I don’t want to. A period called the Endarkenment follows a world economic and net crash in the 2030s. When the organization “Stability” pulls out and no longer offers protection, roving bands threaten. · Even as there is a slight uplift at the end, this book leaves me accused, powerless, dark, scared, anxious for the future -- shuddery. I finish, not believing such fantasy possible, sad and wanting to be done with The Bone Clocks. Tick Tock, Tick Tock, says a telltale bone clock. Beneath the floor? Beneath my skin? I can't find a good way to get alerts on your new posts. Although I have it listed in my reader it doesn't give me an option to get the alert coming through into the in box. is there any other way to follow you other than via Google Friend which I don't use? I don't know. I plan to redo this site this spring and will probably switch to wordpress. I am going to get some help to do that so maybe I can add a place to subscribe by email.